"Browser Agnostic": One of those terms web developers throw around at production meeting to evade questions of compatibility. I've found the whole web control thing to be a black art. I've kept a whole arsenal of things to try and I've never seen a guaranteed "this one always works" solution. For some reason my IE will work just fine when the person sitting right next to me with the same OS and theirs doesn't work. With IE it seems that certain plug-ins need to install. And it seems there are two things that need to install. In other words you launch one time, installs the first plug-in but doesn't work, launch a second time and it installs the other one and works. My IE is actually pretty good at working. I also find that RealVNC and TightVNC work when IE doesn't. I have presets setup on the VNC clients with the "usual" settings but they don't always work. Also the clients don't like to run multiple instances at one time, which IE can do. SO which IE are you using?. My Company uses VNC for troubleshooting. It's on a different Network than my Controls are on , So I can not use that one. Does Tight VNC have to be activeed on the panels or do I just need to know the IP ahnd Ports. I don't think you quite understand. TIGHT VNC CLIENT resides on your PC, is like a browser/viewer to connect to VNC servers. The AMX panels have a VNC SERVER in them, active if you turn on "G4 Web Control". In the panel, you set what port the panel will offer for VNC, and a VNC viewer/client can be used to connect at the panel address and port. TIGHT is recommended as a client (there is a TIGHT SERVER too but you don't need that). Some VNC viewers can't handle the AMX 18-bit color depth correctly, so just use TIGHT. The problem you have with trying to use IE or other browsers is that the plug-ins are out of date and security settings won't let them run. The VNC plugins for browsers are the problem, and NOT USING A BROWSER is the answer. 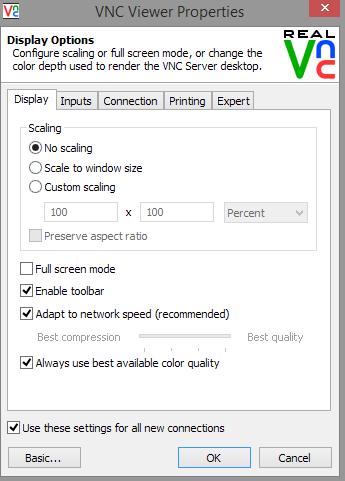 You do need to access the Advanced options to get to these... but the main one that needs to be enabled is "Always Use Best Color Quality"
See technote 1029 to help get RealVNC going. I use UltraVNC and it works flawlessly. can anyone explain how to connect via VNC when the touch panels are on the ISCLan? That's just IP Networking 101... The ICSLAN is just an isolated network with the router being located inside the NX-based master. To make that work your laptop would need to be plugged into the ISCLAN. Hence, this is a good example of why you shouldn't put TPs on the ICSLAN... You should only put devices that never never never need to access the outside world. So, as long as you don't need to use the VNC port, you're okay. Otherwise, put the panel on the same network as the computer and point it to the NX master via its outside LAN port. Just FYI, on the Mac version of RealVNC, there isn't a companion "use best color quality" checkbox. Instead, to keep from getting the black screen, I have to turn off "Adapt to network speed" and run the quality slider bar up to maximum. Otherwise, works great.